The European Organization of Nuclear Research, more commonly known by its French acronym “CERN” (Conseil Européen pour la Recherche Nucléaire), hosts the largest and most complex scientific experiment in the world, by far. 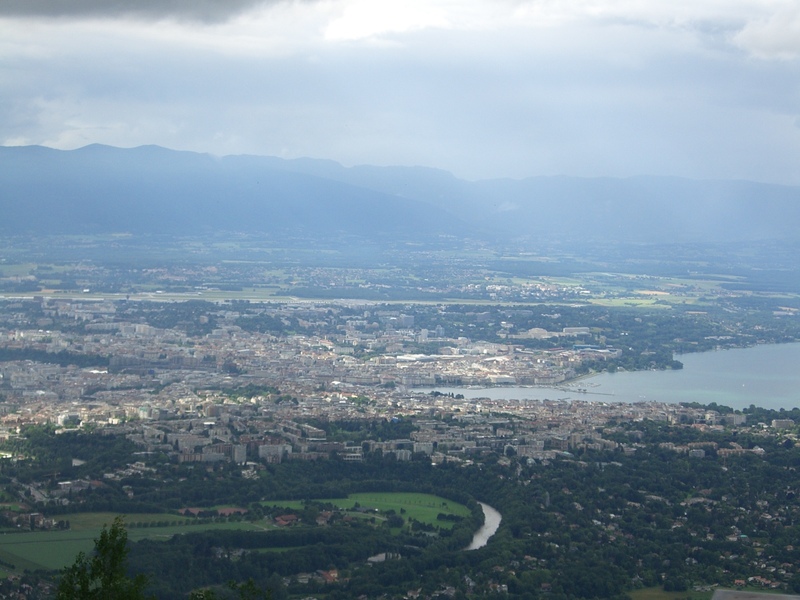 Located near Geneva, Switzerland, scientists from all over the world unite here to study the most fundamental components of matter and the nature of the universe. For physics enthusiasts like me, CERN more than rivals Disney World. I can’t wait to visit the place I’ve read so much about. The 2010 Intel International Science and Engeneering Fair (ISEF) award judges could not have selected a happier recipient. >> Click here for a comprehensive overview of CERN from CERN’s own website. >> Click here for a general overview of CERN that also discusses the connection between art and science. >> Click here for a New York Times article describing recent developments at CERN. Most of the CERN researchers don’t actually live here. They can work almost anywhere because data collected at CERN is highly accessible via the Web. Before winning this trip to CERN, I met with a graduate student at University of Maryland (UMD) who conducts research at CERN. She visits CERN about once a semester to maintain one of the particle detectors on the Large Hadron Collider (LHC). At UMD, she analyses the data she programmed this detector to collect. There are two other UMD graduate students conducting CERN research in a similar fashion, and, one UMD professor who works full-time at CERN. Clearly, CERN is an international project attracting some of the brightest researchers from all over the world. The CERN Special Award coincided with my family’s hiking trip in England’s Lake District, so I spent two great days in England with my sister, parents, three cousins, aunt and uncle before heading off to Geneva. 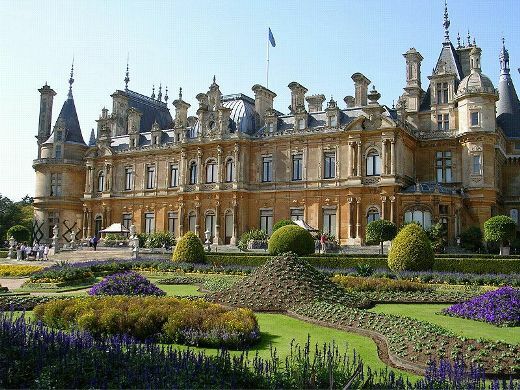 The first stop on our drive to the Lake District was Waddesdon Manor, the dazzling mansion commissioned by Lord Rothschild in the late 1800s. Our original plan was to see both Waddesdon Manor and Blenheim Palace today, but we encountered heavy traffic due to an accident on the way to Waddesdon, so we decided to spend the whole day there. For lunch, we ate in my favorite café at Waddesdon: the Stables. I had a delicious baguette sandwich and their famous cream tea. I can’t imagine a more gorgeous place to spend the afternoon! It was a beautiful blue-sky day; all the gardens were bursting with blossoming flowers. The house was stunning. Rothschild built it about 130 years ago to showcase his fantastic art collection. Dying without an heir, he left the house and its contents to the National Trust. Moreover, he endowed the Trust with enough money to properly maintain the house, so it is noticeably better kept than other historic English homes. The largest chandelier in the house takes one person two days to clean! Dad and I left our hotel at about 5:15 a.m. and drove to London Luton airport, where Dad dropped me off so I could catch my flight to Geneva. The first person I met in the Geneva airport was my Intel partner, Jennifer! Outside baggage claim, we grouped with nine of the 12 CERN Special Award Winners from this year’s Intel ISEF and our chaperones, Wolfgang and Diane. Our little group included students from Hawaii (12 hour time difference! ), Kentucky, New York, Chicago, Nevada, Maryland, China, and Turkey. We then took a bus to CERN, arriving at 11:00 am. Our bus had the CERN logo on the side! Since our rooms in the CERN hostel wouldn’t be ready until after lunch, we left our bags in one room and headed to the cafeteria, where Wolfgang handed each of us an itinerary, visitor’s card, and set of meal vouchers. While we were eating, Wolfgang pointed out to us a Noble laureate sitting across the room! Aha! 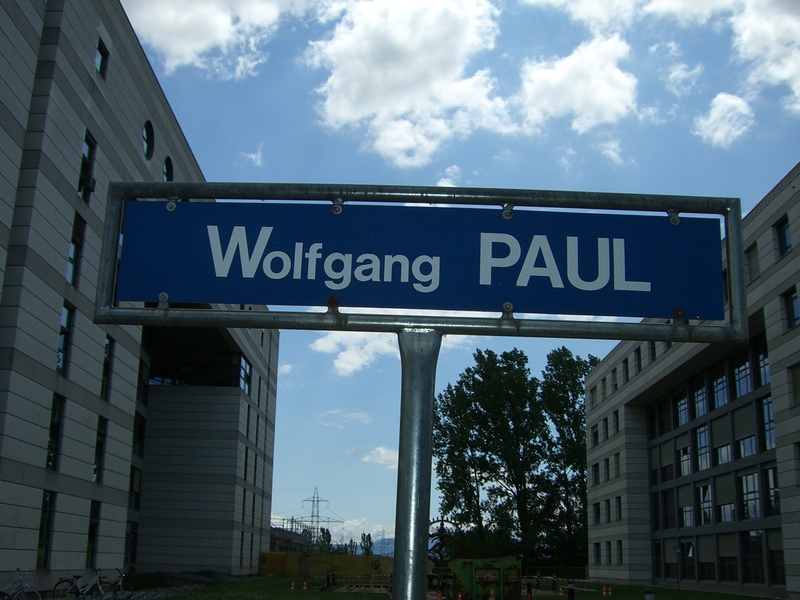 There’s a street outside the hostel named after Wolfgang Paul, the Nobel Prize winning-physicist who developed the ion trap, which was the focus of Jennifer and my research! After lunch, we took a half hour break in our hotel rooms. I use this opportunity to take a shower, while my roommate (Daniela from Chicago) took a jet lag-induced nap. We then took a bus to Geneva. 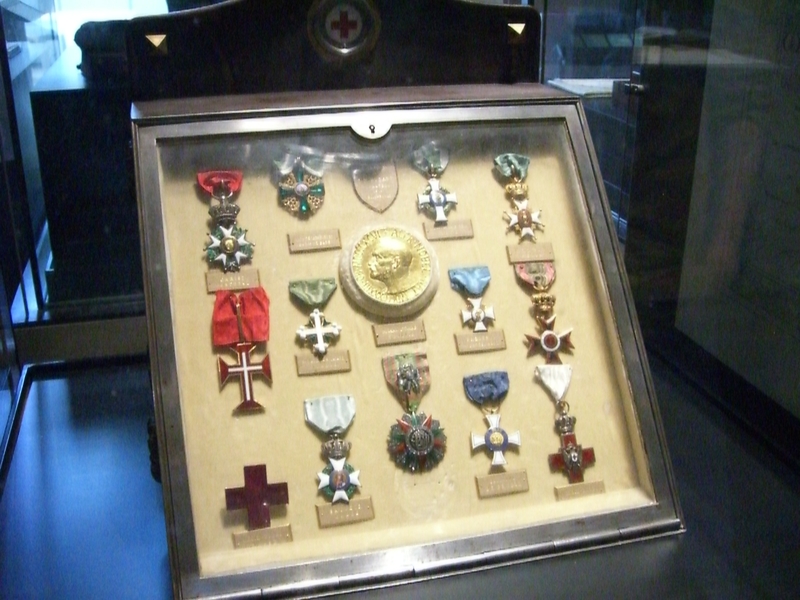 Our first stop was the Red Cross Museum, where we spent about an hour. 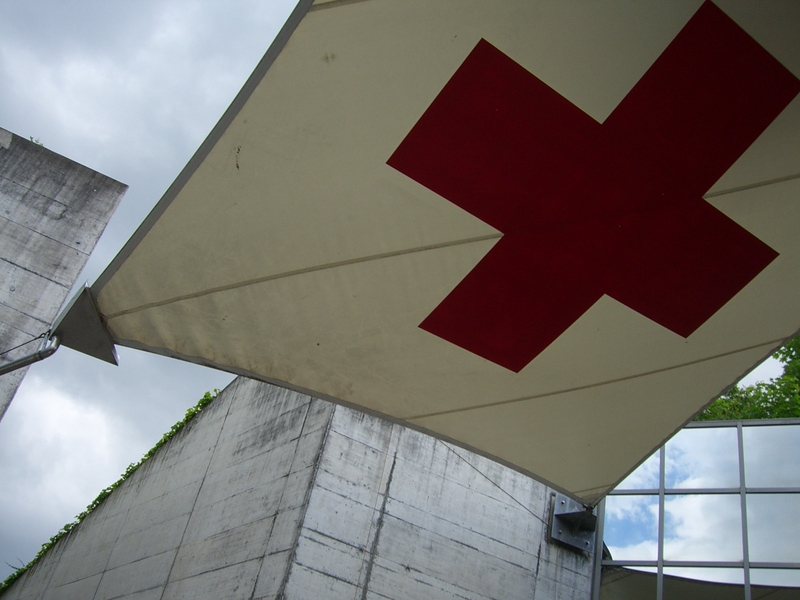 Red Cross flag acting as a ceiling outside the museum. The gold medal in the center is a replica of the first Nobel Peace Prize. 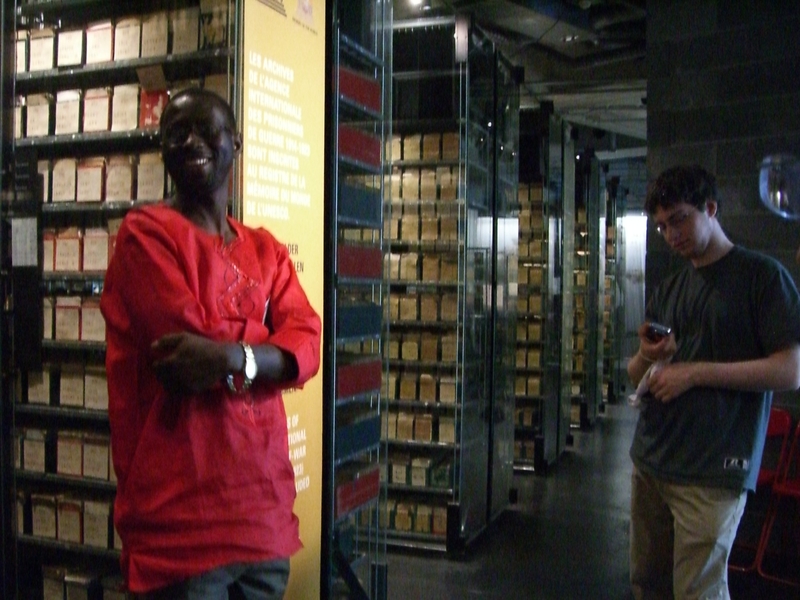 Our tour guide in front of bookshelves. If you look closely, you can see there are blue, white, and red cases in the book shelves. Those indicate whether the person mentioned in the papers is dead, captive, or missing. 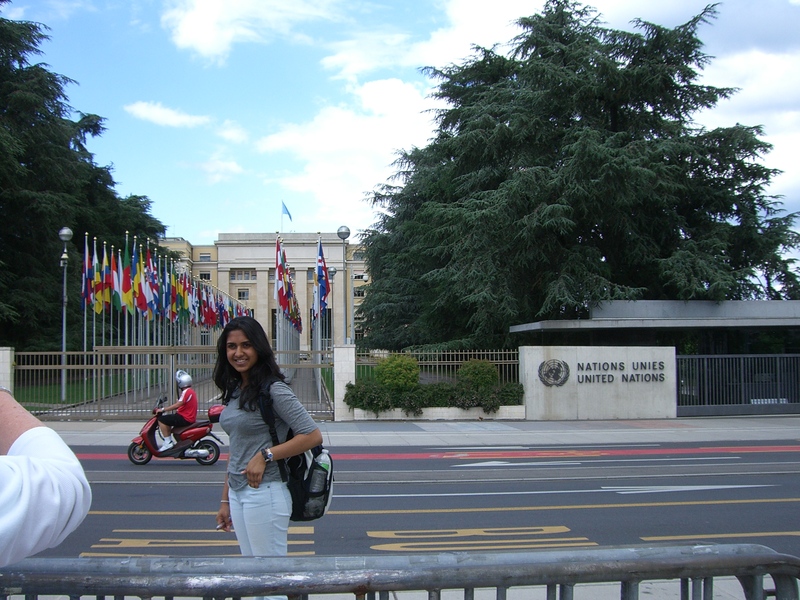 Next, we quickly visited the United Nations headquarters, although we only saw the exterior. United Nations Building. See the many flags? 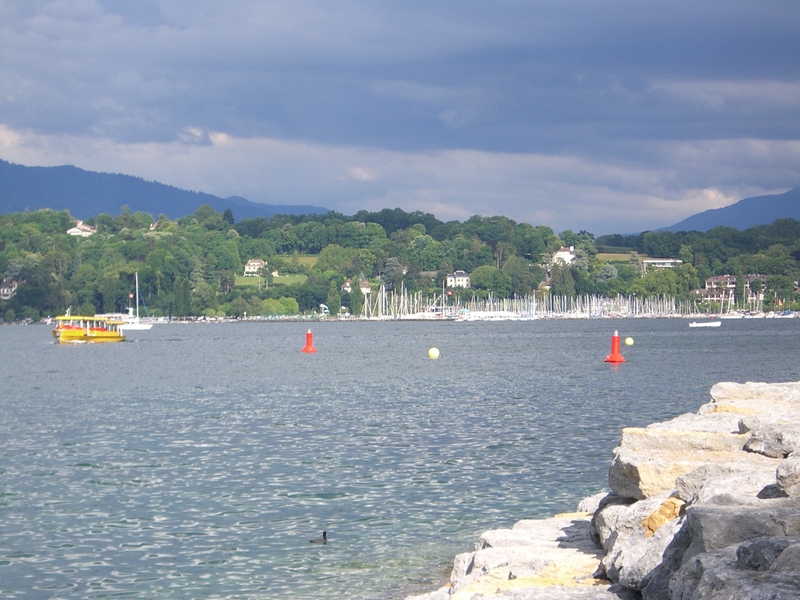 Then, we walked around Lake Geneva. It was a gorgeous day; the lake looked cool and beautiful. I’d love to live in one of the town houses on the mountain side surrounding the lake. Nice place to live, eh? Finally, we took our CERN-bus to an Italian Restaurant for dinner. Afterwards, we walked back to CERN with a computer scientist who speaks four different languages! Along the way, we passed the set of buildings where CERN “clubs” meet, e.g., the music club, food club, etc. It’s nice that CERN employees can indulge in non-science interests. Also, I noticed the street lamps here don’t match, which is a bit strange. Maybe they’re recycled? My roommate and I woke up at 7:30 this morning. We were supposed to meet everybody at the bus at 8:45, so I went down to breakfast at 8:15. No other ISEF student was there, so I walked around a bit, eventually eating mango yogurt and tea for breakfast at 8:30 with the other students. Although we left the breakfast room a little later than planned, we had a nice start to a great day! We then walked to a small conference room in the computer center directly below the room where the World Wide Web was invented. Amazing! Here, we listened to three intriguing lectures from CERN scientists. Wolfgang gave the first lecture, which was an introduction to CERN. Wolfgang has worked here for 35 years, so he knows everything going on here. He told us about basic particle physics, CERN’s mission, history, and some specifics on computing at CERN (which is his area of expertise). Next, Dr. Helmut Burkhardt gave us an introduction to accelerators. He said, rather philosophically, that the LHC, which is 27 km in circumference, is small on the scale of the universe; it’s only large on the human scale. And, of course, the LHC is meant to study the nature of the universe. Finally, Philippe Lebrun told us all about superconductors, which play an enormous role in the accelerators. After lunch in the cafeteria, we heard a great lecture by a scientist from India, Dr. Archana Sharma, who’s worked at CERN for 25 years. She talked to us about the detectors. I had previously learned much of what she said from Elizabeth, a physics grad grad student I met while studying at UMD, but it was still very interesting. Dr. Sharma then showed us her lab, which is in the CMS warehouse. (CMS is one of the detectors on the LHC). 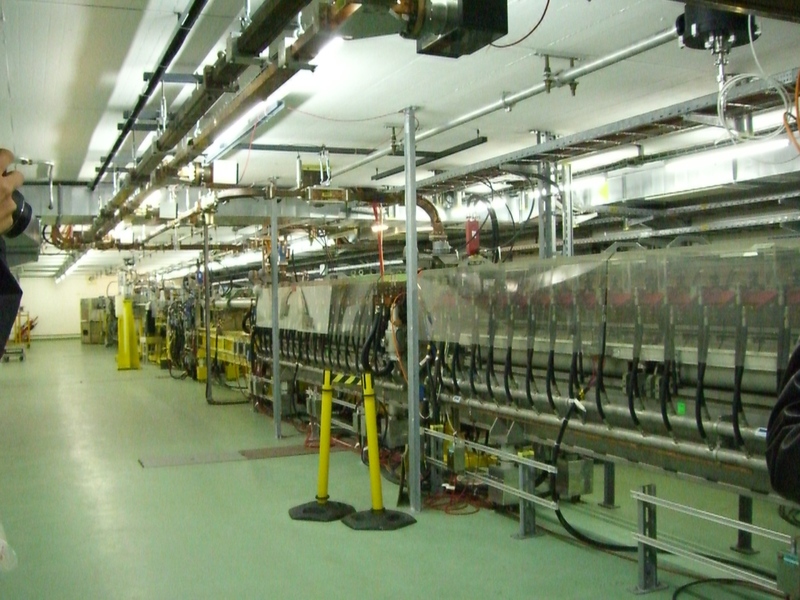 This is where the detector was assembled. Interestingly, CERN doesn’t have enough money for a huge, centralized computer center. Instead, they send their data via fiber optic cables leased from telephone companies to computing centers around the world. This system works well because it’s much easier for a university, for example, to get 100 computers dedicated to CERN, than for CERN to get the tens of thousands of computers they need all in one place. On the other hand, allocating computing and storage resources to many places is inefficent compared to having all computing resources in a few data centers. After visiting the CMS workshop, we returned to the conference room and heard a lecture from a computer scientist, Filippo Costa, who works on the ALICE detector on the LHC. We couldn’t go underground to see the detector because it’s too dangerous while an experiment is running; but we toured the control room, electrical room, and the entrance to the underground passageway. 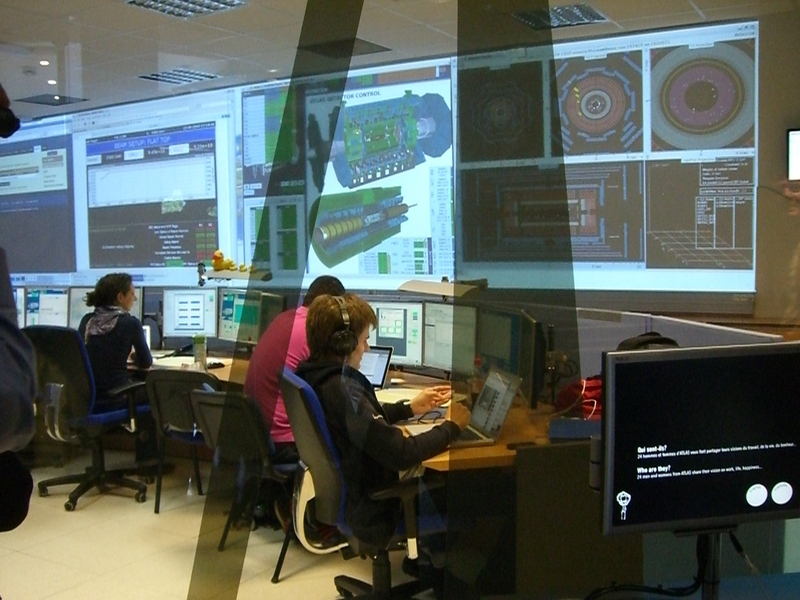 In the ALICE control room were about eight computer scientists. Three of them had six monitors at their desk! Another had eight! I think the number of monitors is a status symbol. 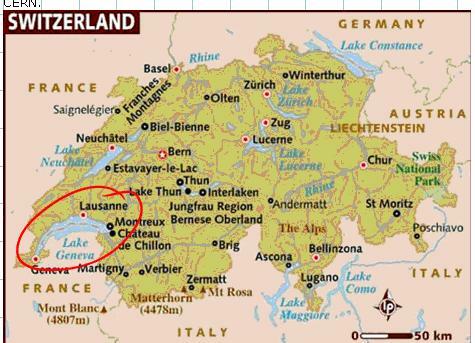 Throughout the day we have crossed the Franco-Swiss border numerous times without realizing it. Thank goodness there is no border control inside CERN! That would get annoying. Our busy day was capped by dinner in the CERN cafeteria. Last night I forgot to put the memory card back into my camera, so I couldn’t take many pictures today, and the ones I did take I can’t put onto the computer until I get a USB cable. Sorry. After breakfast at 8:30 this morning, we took a bus to the CMS headquarters. CMS is one of the four detectors on the LHC; the acronym stands for Compact Muon Solenoid, because the detector is half the size of the largest detector (hence, it’s “Compact”); it has special Muon detectors; and, like all the detectors, it’s a huge Solenoid. ﻿Interestingly, the largest detector, Atlas, would float if you wrapped it in a plastic bag and threw it into a river, but CMS would sink because although it’s half the size, it weighs twice as much. In a large conference room at the CMS headquarters, we met with Dr. Tejinder Virdee, who is essentially the “CEO” of CMS, although his official title is “spokes person.” Last year, he was the main speaker at Intel ISEF! He’s also a professor at Imperial College in London. He started his fabulous talk by giving us a basic overview of the physics related to CERN, and then he moved on to more complicated and specific information about the CMS detector. His talk was one of the most understandable and informative I’ve heard. We then stood directly above the CMS detector. A few years ago, the detector was lowered about 100 meters below ground onto the LHC. Below is a suspenseful time-lapse video of one piece lowering; we stood directly above where this happened. After touring this landmark, we visited the CCC, or CERN Control Center. We met in a conference room with large windows overlooking about 25 people working on computers. Dr. Django Manglunki talked to us. He was in charge of building this control center, and the two computer science enthusiasts in our group especially appreciated his informal lecture. We then ate lunch at a restaurant in France near CERN. Everyday, Wolfgang invited the scientists who spoke with us to join us for lunch/dinner. This way, we can ask them more questions, learn more about CERN, and discuss physics over every meal. It was a terrific idea. Today at lunch, Jennifer, Zaren and I sat with Filippo Costa, the Italian computer scientists/physicist who spoke to us yesterday and showed us the ALICE control rooms. He’s been working at CERN for two years. After working here for five years, a committee meets and decides whether that person will stay and get promoted, or leave. Wolfgang ordered dessert for us too (another great idea of his)! I had a delicious crème brûlée. After lunch, Dr. Alberto Pace (who was a judge at Intel ISEF) spoke to us about computing for the LHC. Alberto is head of the data and storage system for the LHC. His talk was most intriguing. I learned that after processing the data on CPUs (processors), they store it on disks or magnetic tape like in a cassette. Also, the data is simultaneously distributed to eleven large data centers around the world, which keep a second copy of the data. Click here for more pictures from today. CERN computing is performed in three “tiers” described below, with 85% of the process preformed outside CERN. Tier 0 is CERN, which collects the data and is responsible for its long-term storage. Tier 1 is comprised of 11 separate computer centers around the world; there are two in the United States, one in Canada, seven in Europe, and one in Taiwan. These centers enable CERN’s “grid service,” which is the network that transfers data from CERN to scientists everywhere. Tier 2 is the end user, the university physicists around the world who look for interesting patterns in the data. 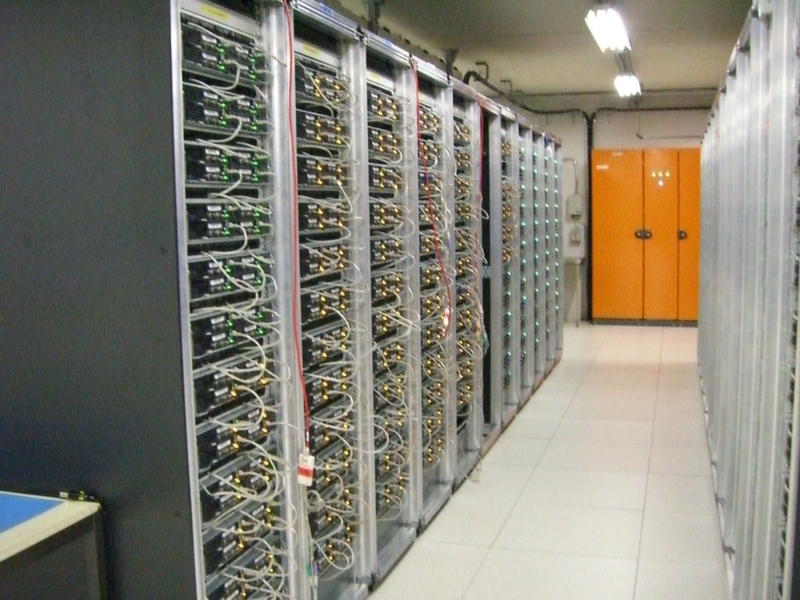 This tier provides more than 50% of CERN’s processing power. Although it would be more efficient and cost effective to centralize these tiers into one computer center, the tier system prevails because it’s easier for a hundred or so universities to contribute about 100 computers each on their campus, than for CERN to fundraise hundreds of millions of dollars for a centralized computer center. After Alberto’s fascinating talk, Wolfgang gave us a tour of CERN’s main computing facility, where there are thousands of CPUs, or disk drives, stacked up in a cold room. Each CPU has little blue and green lights flashing endlessly in seemingly random patterns. I asked Wolfgang if these blinking lights were really necessary; he said no. A computer does all the checking regardless of the lights, although when someone has to come down here to fix something, it’s convenient that a flashing red light indicates what’s broken. Finally, we toured the ATLAS detector control room, which had a very nice museum-like educational display. They also showed us a 3D movie about ATLAS! Wolfgang then gave us all nice laptop bags with the CERN logo, CERN mugs, a set of adapters, an Intel pen, and CERN magazines; it felt like Christmas! This was just one of the many nice things he’s done for us. I’m going to use the bag at MIT next year. Interestingly, all the lecturers we’ve heard put only their first and last names on the slides, leaving out titles such as “Dr.,” “PhD,” etc. Also, the scientists introduce themselves to us by their first name. This possibly indicates several things: 1) They don’t feel the need to show-off their title; 2) They’re not treating us as students; and/or 3) They want everyone to have an equal status. Anyway, it’s different from many of my experiences. Also, today there was much talk of Angels and Demons, the fictional book by Dan Brown and action movie starring Tom Hanks. I’ve neither seen the movie nor read the book, but I understand the plot is centered on CERN research. I’m now curious see the movie, although the physicists here are amused by the book/movie’s fictional adaptation. When Tom Hanks and Ron Howard (the movie’s director) visited CERN, they presented one of the “antimatter generators” used in the movie. It’s a cool-looking device that Wolfgang said he will show us on Thursday. Afterward, we ate dinner in the cafeteria and chatted in Building 40, which is near the hostel. I believe most people sat in the lounge downstairs, but I accompanied Zaren to a meeting with a Turkish physicist. Unfortunately, they both only spoke Turkish together, so I politely excused myself from the meeting after about 15 minutes to play cards with the other students downstairs. 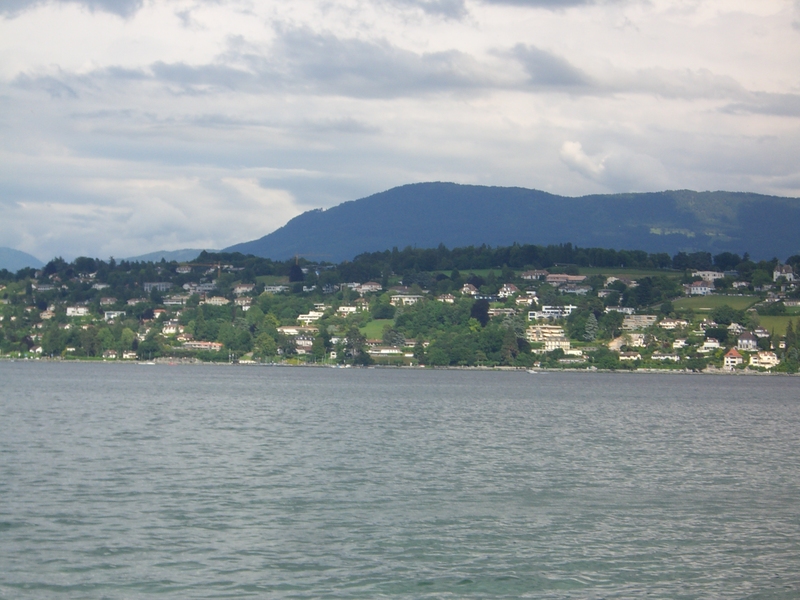 After breakfast, we rode in a fancy coach bus to the top university in Switzerland, the Swiss Federal Institute of Technology (EPFL), which is located on the north side of Lake Geneva. Professor Maya Frühauf greeted us and introduced us to EPFL’s curriculum. 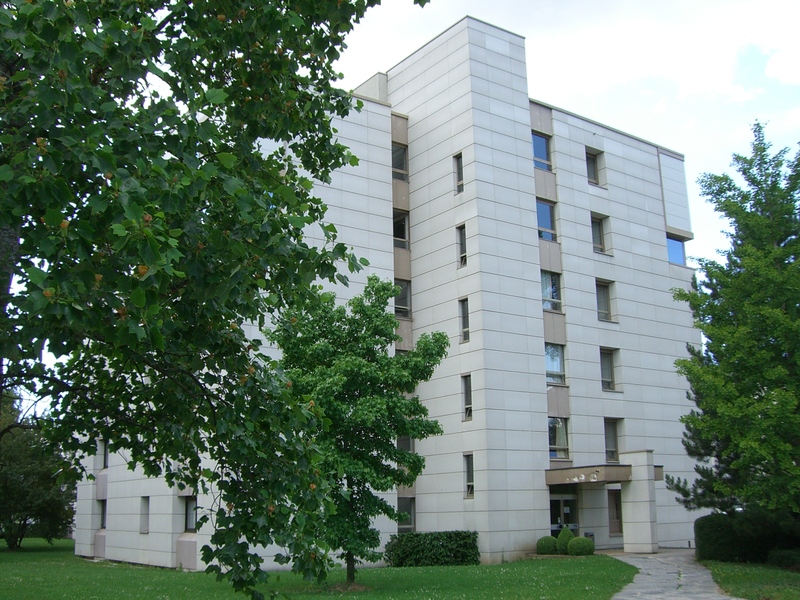 The university’s campus is known for its cool architecture and interesting engineering projects. The architects who designed one of the buildings here won the Pritzker Architecture Prize (which is like the Noble Prize for architecture). The campus has a very clean and artistic atmosphere; even the chemistry labs are organized and colorful. The founder of Logitech studied here; so did the builders of the world’s fastest sailboat, which traveled at 51 knots. Rolex Learning Center at EPFL; the architects of this building won a prestigious award. 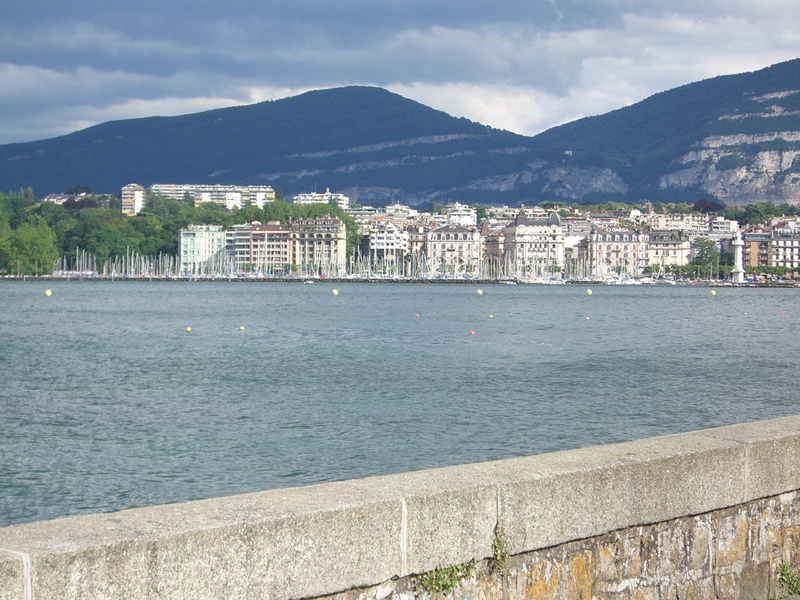 A graduate student explained to us the sophisticated audio/visual system he helped construct for a prominent jazz festival in nearby Montreux. He played us a video from the concert with his specially designed surround sound system. It was sensational! Jazz isn’t usually my favorite music genre, but I could’ve listen to this hours; both the musicians and the sound system were amazing. Dr. Felix Schürmann, an EPFL professor, then gave us a short presentation about the project he’s directing, the Blue Brain project. I found his talk extremely fascinating; it made me want to be a brain/cognitive science major as well as a computer science major at MIT. The goal of the Blue Brain project is to computer-model the human brain. Of course, this has never been accomplished and is a monumental task. Researchers face many challenges not only because of our limited knowledge of brain chemistry, but also because of inefficient computer systems. For example, 1000 computers may be working together to simulate the brain. Although this is a lot of processing power, it’s very difficult to effectively utilize all of it because sometimes all but one of the computers need to wait a long time for the result obtained by one computer, representing one neuron. I’m completely fascinated with this problem, and have no doubt the new era of parallel, GPU, and/or quantum computing will someday help complete this project. We ate lunch together in the university cafeteria with two exchange students from the University of Idaho. They’re junior undergraduates who both spoke French before arriving in September. They said it’s difficult to socialize with other students here because the natives go away on the weekends to visit family, and many hang-out in exclusive social groups. Yet, when I asked them if they were glad that they did the exchange program, they nodded enthusiastically. One of the exchange students told us about an “insightful” metaphor she read in her French culture textbook: “Europeans are like coconuts, and Americans are like peaches.” The idea was that Europeans are hard to crack (in terms of personalities), but they’re diverse and interesting inside. Americans, on the other hand, are easy to open up, but keep secrets in an impenetrable core. I thought this was totally weird. Even Wolfgang raised his eyebrows. We looked at the Rolex Learning Center (pictured above) before heading back to the bus. It was magnificent! The inside is mostly one level, but the floor is curved so there are hills inside. It seemed like a very calming place to study. 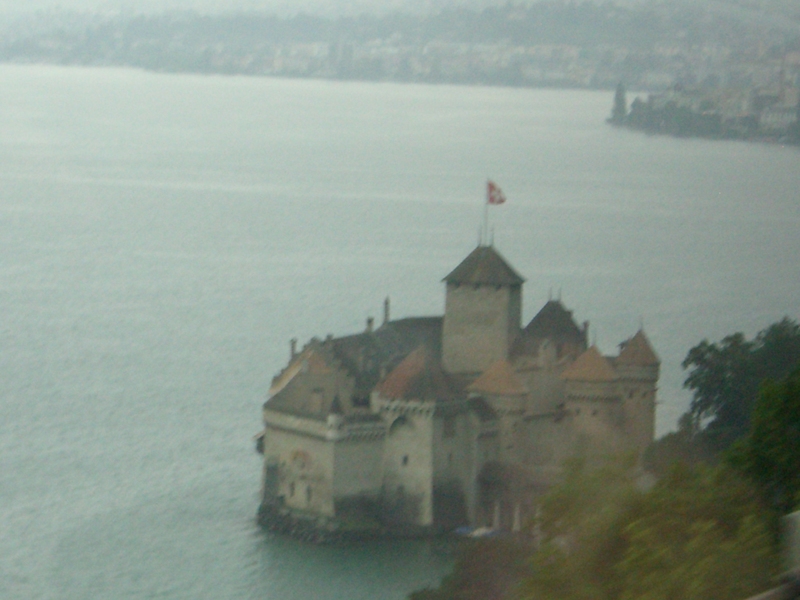 From here we said goodbye to our host, Dr. Maya Fruhauf, and drive along a scenic mountain road to Chateau Chillon. 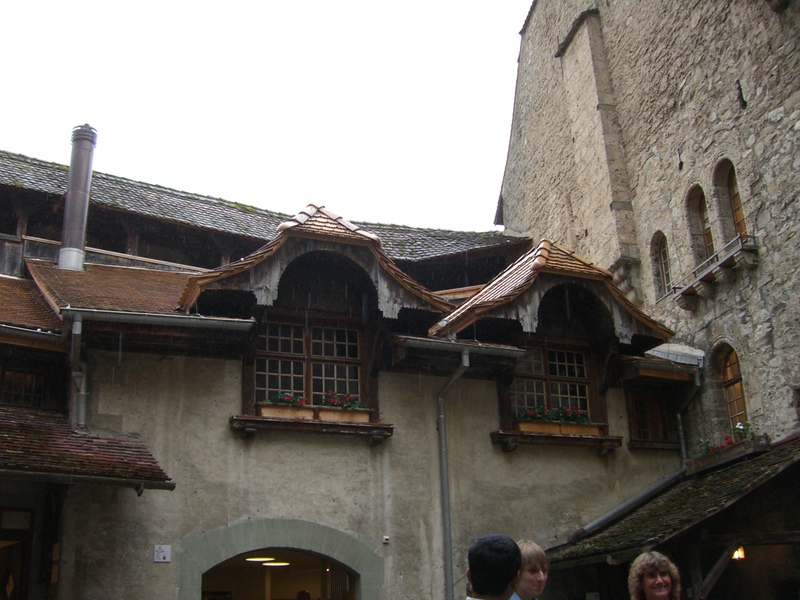 After lunch we visited the enchanting Chateau Chillon, a medieval castle on the water. After touring the castle, we went shopping for chocolate in Geneva. Our original plan was to walk around the city, but rain thwarted us. Instead, we ate chocolate and dined in a fine restaurant! Since Wolfgang wasn’t with us this afternoon because he had to rehearse his saxophone solo with CERN’s jazz band, another CERN scientist, Kristina Gunne, led us to the best local shops and took us for dinner. We had a delicious meal and a great time! We started the day by walking briskly to the CLIC facilities, where CERN scientists are prototyping a linear accelerator. All the other accelerators here, such as the LHC, are circular. A linear accelerator, on the other hand, would be more efficient because it wouldn’t waste particle’s energy by forcing them to turn. Researcher Frank Tecker talked to us about CLIC and showed us a prototype of the accelerator that filled a basement the size of two tennis courts. Taylor, a student in our group from Texas, always carries a radiation detector with him. Much to his delight, his detector went crazy in a few areas of this building. Getting to know the other 11 students on the trip has been a great part of this experience. After touring CLIC, we met with an antimatter expert, Michael Doser. He impressed us all with his engaging and articulate explanation of the research under his guidance. He also conveyed to us the idea of super symmetry, which is that every particle has a “symmetric” particle associated with it. For example, electrons have positrons, matter has antimatter, etc. Currently we know much more about matter than antimatter, but Michael is trying to change that by studying a very important property of antimatter: gravity’s effect on antimatter. His work may have applications in cancer treatment and medical imagery! After lunch in the cafeteria, we quickly stopped in CERN’s souvenir shop, where we bought everything from t-shirts with math equations, to rain jackets with the CERN logo and squishy pens. 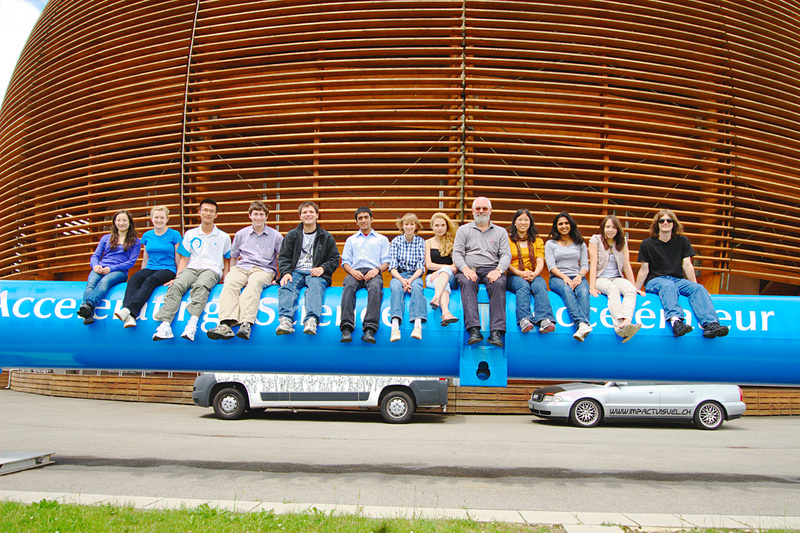 Finally, we visited CERN’s iconic Globe, where we took a group picture sitting atop a tall blue sign. This “sign” was actually one of the magnets from the LHC; today there are 1200 such magnets functioning on the accelerator. Wolfgang had to lift us short ones up onto the sign. We were the first people to see the exhibit inside the Globe! 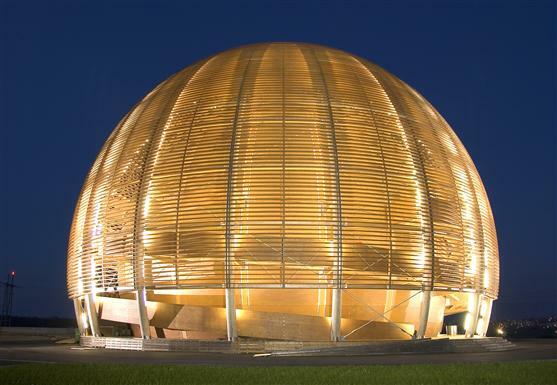 It officially opens tonight, when a group of CERN leaders will meet there for a conference. The exhibit was fantastic! It cost 2 million francs and was sponsored by Rolex. The exhibit was so well designed it was easy to learn without trying. There were small artifacts and interesting facts in curious cases that looked like eyeballs. There were also posh chairs that looked (and were) so comfortable you couldn’t resist sitting in them. Each chair even played about a two minutes audio clip about an aspect of CERN! Also in the exhibit were large circular touch screen-tables displaying interactive maps and tutorials. Better still, every 30 minutes or so an epic movie played using all the walls in this one-room exhibit as the movie screen. It was the ultimate movie experience! 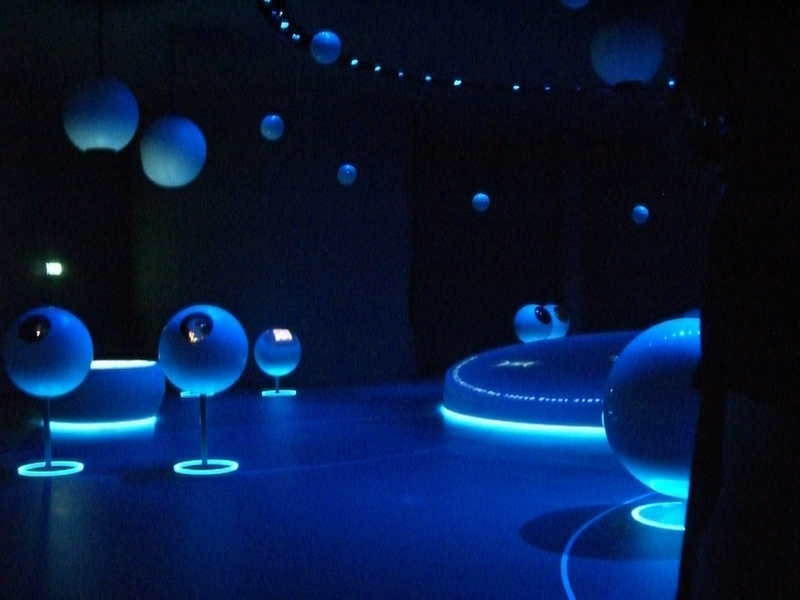 CERN exhibit inside the Globe; inside each of the eye-ball shaped cases is an interesting fact. CERN exhibit inside the Globe; the whole room turned into a a movie screen for a short video on the Universe. After viewing this fascinating exhibition, each of us followed a different CERN scientist for an hour and a half. On Monday, Wolfgang asked each of us what type of work we were most interested in, and assigned us to a scientist accordingly. I met with a mechanical engineer who did most of his work using 3D computer modeling software. He showed me a poster describing a part of the LHC his team designed. I was amazed at how much planning goes into just a few small pieces of such a huge system! He also showed me the machine shop at CERN. I’ve never seen a machine shop so clean; there was hardly any dust on the floor. Must be a Swiss thing… They had a really neat machine about the size of a compact car that milled objects with extreme precision. 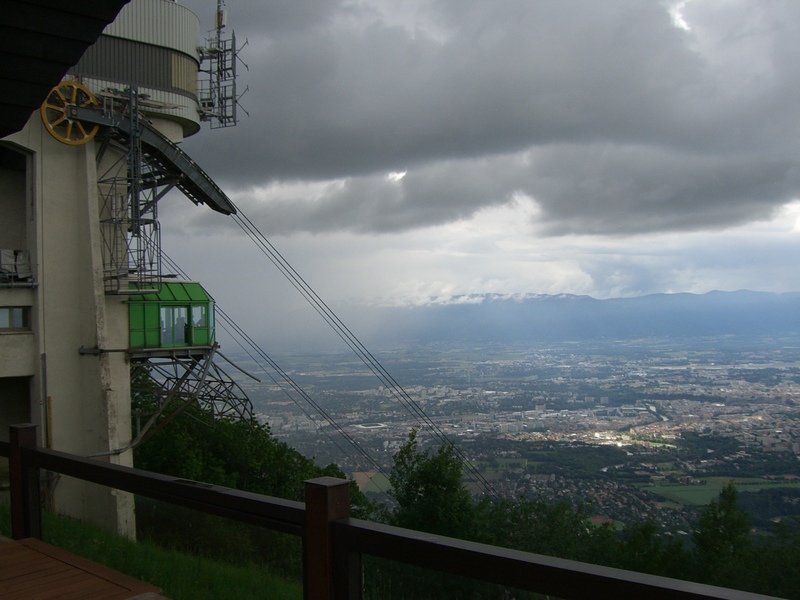 After saying goodbye to our CERN scientists, we took a bus to Veyrier, at the base of Mt. Saleve. From here, we rode a cable car to a restaurant atop the mountain. I couldn’t believe Wolfgang said he biked up this mountain! The views were gorgeous. 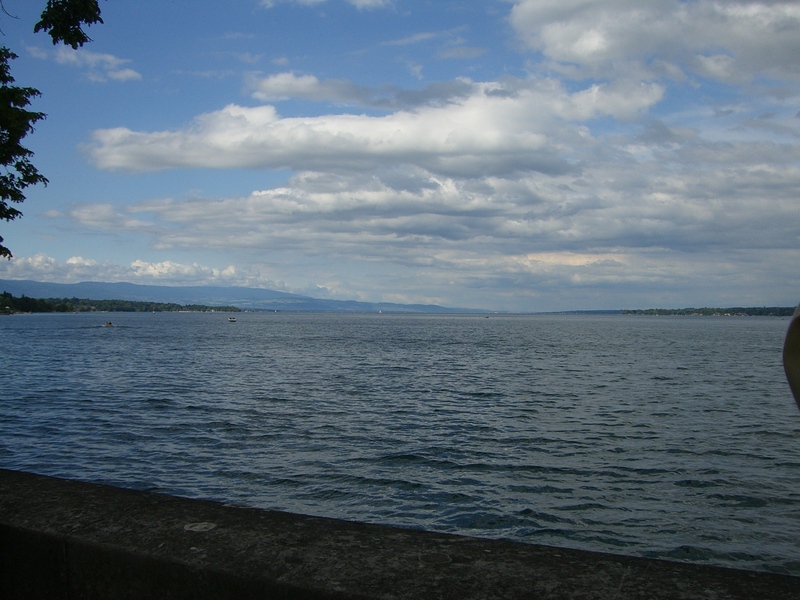 We could see Lake Geneva and CERN. Top of railway, as seen from restaurant balcony. Note: this isn't the top of the mountain! Wolfgang led us on a hike closer to the peak. Before dinner, Wolfgang led us on a hike further up the mountain, which was quite refreshing. We made it to a grassy landing near the very top, at which point it started raining (it was drizzling when we started). Luckily, I bought a rain jacket at the CERN gift shop! Needless to say, we were exhausted and hungry by the time we made it back to the restaurant. We had a delicious meal! It was perhaps the best of the many great meals we’ve had this week. The main course was fish caught in Lake Geneva topped with a foamy vegetable-based sauce, some dill, and veggies on the side. 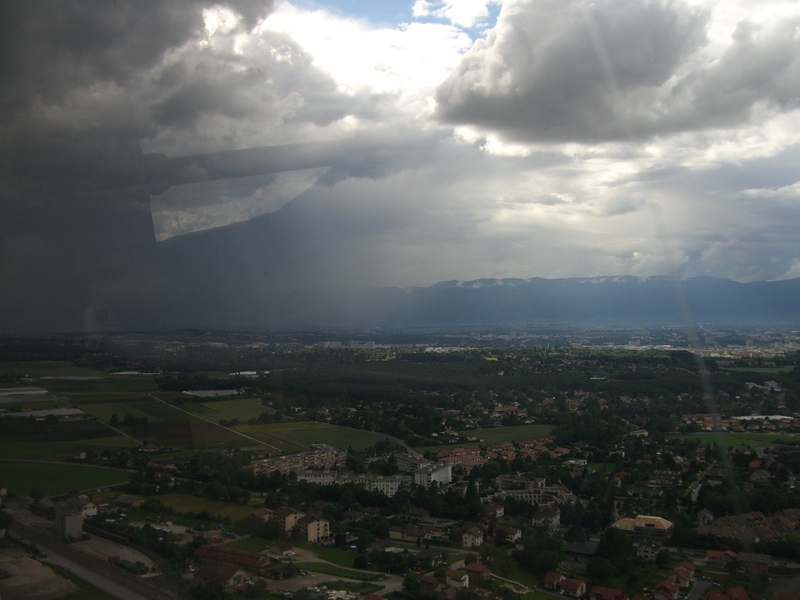 From the large windows in the restaurant, we looked down on Lake Geneva and CERN. After dinner, we met in a room upstairs in the restaurant to see video clips about CERN. Wolfgang showed us several commercials, including one by Intel that highlighted CERN’s research. He also showed us pictures of his adorable grandchild. A few of us took this opportunity to read Wolfgang the poem we composed for him during last night’s dinner (see the Poems page in this blog). He got a little teary-eyed and asked to keep a copy, so I think he appreciated it. I cannot imagine a better host. It was a great way to end such a memorable week.